Carolyn Egan has been the elected president of the Steelworker Toronto Area Council since 2004. She had previously served as vice president. She is also president of USW Local 8300 where she earlier held the position of recording secretary, unit chair and steward in her workplace. She is the vice president of the Steelworkers Humanity Fund. Carolyn is very active in the community as well. She is the president of the community board of the Immigrant Women’s Health Centre and Co-Chair of the Good Jobs For All Coalition which is fighting for a just transition for workers and good, green jobs for all. She sits on the executive of the Toronto and York Region Labour Council and is Co-chair of the Toronto Health Coalition. She has played a key role in organizing the International Women’s Day March in Toronto each year and has been prominent in the women’s and reproductive justice movements. She has been awarded the Constance Hamilton Award for her work by the City of Toronto and the Women of Distinction award by the YWCA. She enjoys time with friends and family, is an animal lover, and is very involved in the Irish community. Roopchand Doon is entering his first term as vice-president on the Area Council but is no stranger to Union activism as he is Vice - president of his local union at Barrymore furniture where he has been working for over 27 years and is in Quality Control. He has been active in his local for the past eleven years as a trustee, treasurer and is now the Vice - president. Roop is family oriented with a lovely Wife, Son and Daughter and Son in Law and they consider themselves a proud Vegetarian family. Roop enjoys playing and singing Hindi music. John Ankenman is a Unit Chair for Local 1998 working out of Victoria University. John has always been an activist and anyone who attends Area Council knows that John is a dedicated Activist and is always participating in the Marches,Conferences and Demonstrations working to change the lives of working men and Women. Rob Stringer holds the position of financial Secretary and takes care of record keeping the signing of cheques. Rob is the vice president of his local 13571 and has been active in the Union for the past 12 years holding the different positions such as Plant chair, Grievance Committee , health and Safety Committee, Steward and Guard. Joyce Griffiths has been a constant here at Cecil st and the Area council. Joyce is the chair person for her local 3950 and has been activist for the past 14 years as a Woman of steel, Health and Safety Rep, Treasurer, Steward and trustee as well as taking part in negotiations. Some of Joyce's interest include basketball, Baseball and Bowling. Anyone that has ever been to Cecil st., a rally or conference knows Fred as he has been involved in the area council as long as most can remember. 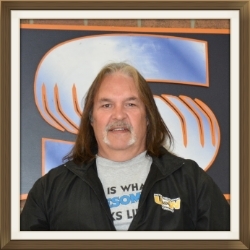 He is a trustee for Local 5296 and has been an activist for the past 19 years Fred has been the Unit Chair at T.N.S., been the recording secretary for Local 8300 and has taken on the chair for the pride parade. Fred is Married with 3 children at home, he is a defender of animals. Fred was the previously on the Board of directors for the Metro Tenants association as well as the London and District Crisis Centre. He is an honourary citizen of new Orleans and hold the distinction of being the Lt Gov. of the Kiwanis for the Atlantic Provinces and the State of Maine. Amos Ennis is the president of his Local and over the past several years he has held positions on the grievance committee, Steward as well as a Guard/Guide. Gordon ( Ed ) Terry represents his Local union #3 as Union President and has for the past 9 years and before that he was unit chair for his amalgamated local #3 for the previous 9 years. Ed works for the Company A.E.P. where he has been for the last 36 years and 34 out of those 36 years have been spent as the co chair of the health and safety committee. Ed has been involved in the area council for some time and is a familiar face at all union activities. On a personal note Ed has a wonderful family, his wife Sandy along 2 daughters and 2 sons he is an old car enthusiast and enjoys all types of wood working.